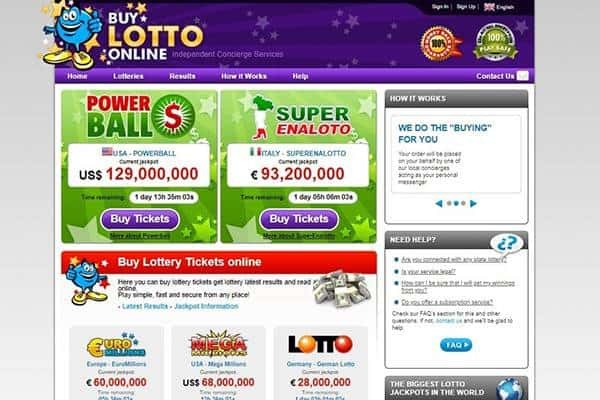 BuyLottoOnline has been online since 2002 and has less than one hundred monthly visits and can be played only on the condition that the player is eighteen years or older. BuyLottoOnline.com is a very user-friendly site where lottery games can be played online. One very important aspect of this online lottery service is that it is available in seven languages to aid ease of use for players all over the world. The languages include; English, French, German, Portuguese, Danish, Spanish and Italian. They also suggest that players who are not satisfied with their quality of service are free to ask for a refund, although, no true evidence of the authenticity of this information has been shown on their site, there is also no time limit on this particular information. 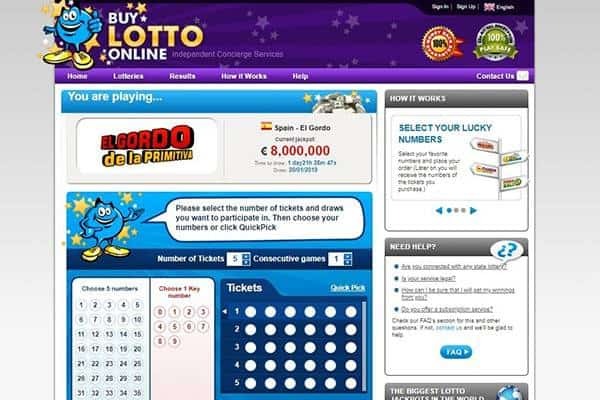 Buy Lotto Online is owned by Ledonford Ltd and its website, BuyLottoOnline.com, and offers eighteen international lotteries to be played online. It has been observed that the site has a link which separates different lotteries from their countries and continents. Such countries / continents include; USA, Canada, Australia, Europe and South America. 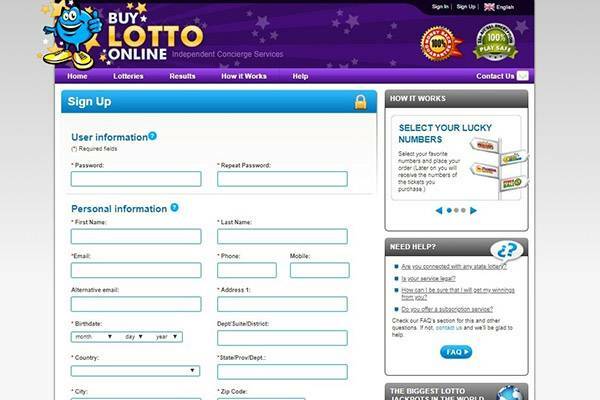 Some major international lotteries offered by BuyLottoOnline.com include; New York Lotto, Irish Lotto, La Primitiva, Oz Lotto, Thunder ball lottery, Mega Sena Lottery, California Super Lotto, Euro Jackpot, Super Enalotto, French lotto, etc. The site has a very good and lively looking mobile interface. The site is user friendly, and all the games are arranged sequentially together with the amounts to be won, in a well-organised manner for you to make your pick quite very easily without any hassles, the site does not offer any means for setting up or entering lottery syndicates, and the website also does not offer any special offers or bonuses. BuyLottoOnline.com does not offer any mobile app, though the site itself has a mobile interface which is compatible with most mobile devices. On their site, eighteen games are offered, and all these games can be played via mobile devices. BuyLottoOnline offers singly a mobile website and works on both Android and iOS. Despite the numerous games offered by them and the numerous countries/continents where BuyLottoOnline is available, there are no promotions offered in BuyLottoOnline.com. Deposits can be made directly through bank transfer, and there are no specific fees required. Other means of deposits include credit cards, debit cards, bank transfer, cheques, and eWallets. For prices up to $600, the winner’s account will be credited and can be withdrawn by the winner. A special claim form will be sent to winners’ emails to fill to claim such prices. 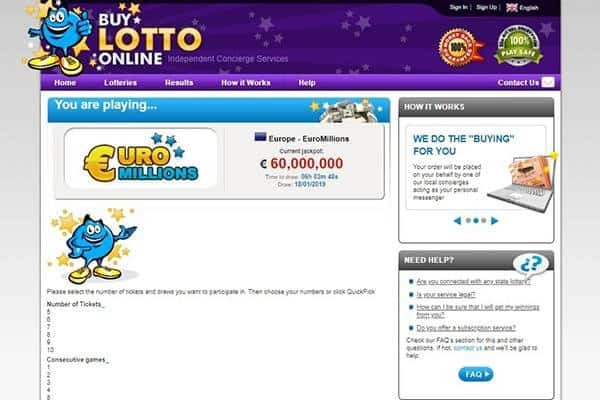 BuyLottoOnline receives the filled form and sends it together with the winning coupon to the head of the lottery operator, who in turn sends the cheque to the winner. A definite point of weakness in buylottoonline.com’s user experiences is its user friendliness when it comes to clearing any concerns. There’s a FAQ page with very little content – far less than what I expect – meaning more questions have to be addressed to the site’s customer support. For those issues or needed clarifications, customer support is available through a contact form or an online live chat that is available during working hours – 8:00 am to 7:00 pm (GMT-3). BuyLottoOnline.com has a very straightforward interface through which numerous games can be played. Despite the fact that they have a comprehensive FAQ page, a live chat, and a contact form on their website, they leave no telephone number or physical address. Thus, they cannot be reached whenever players have any issues to be solved. From this simple indication, the site cannot be said to be legit. With less than a hundred monthly visits by customers, despite being online for more than fifteen years, the reputation is not strong enough. No fraudulent cases have been recorded against the site, but most customers complain about not receiving replies from the customer service. The site is protected by Google safe browsing, Norton Safeweb, and website antivirus. BuyLottoOnline does not have any accreditations and does not have any evidence of being licensed on their site. The site certainly cannot be recommended for use by aspiring lottery players. There is no disputing the fact that the site is home to over fifteen international lottery games, and this could be quite tempting, but the site has no promotions or bonuses to offer, and the absence of substantial information on a means through which they can be contacted is another huge factor to consider. With BuyLottoOnline, you never miss out on the best lotto games worldwide; you can purchase lottery tickets, play the biggest games, and check your results, all in one site and only one click away.